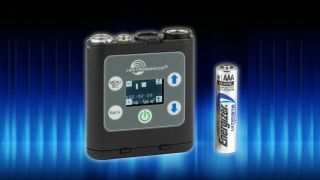 The What: Lectrosonics is now shipping a new micro digital recorder, the PDR (Personal Digital Recorder) for professional use. The What Else: The PDR records in 24-bit, 48kHz digital onto a Micro SD card (HC type) in the industry-standard .wav (Broadcast Wave File) format. The PDR can be jammed to external time code via the standard five-pin Lemo connector. A headphone output jack allows for monitoring the signal input or listening to previously recorded files. The input connector is the industry standard TA5M jack that accepts any mic or line level signal, and provides bias voltage to power a wide variety of electret lavaliere microphones. The input connection and wiring is compatible with microphones pre-wired for use with Lectrosonics professional wireless microphone transmitters with servo bias-type inputs. Setup and adjustment is made through an intuitive interface provided by the keypad and LCD. In keeping with typical Lectrosonics mechanical designs, the housing is machined from a solid aluminum billet, then hard anodized for the ruggedness needed in field production. The PDR runs for more than 6 hours on a single lithium AAA battery. Audio specifications: 20–20kHz frequency response, 105dB(A) signal to noise (in HD mono mode), and less than 0.035 percent distortion. Time code is SMPTE 12M–1999 compliant. The PDR is 2.3 by 2.1 by 0.7 inches (60 by 54 by 17 mm), and weighs 2.5 ounces (71 grams) with battery. The Bottom Line: For situations in which the distance is extreme or where using a wireless microphone is not practical, the PDR recorder can travel with your subject and capture professional quality audio, synchronized with timecode. The tiny size and rounded shape make the PDR unobtrusive and easy to place in garments and costumes, and easy to conceal when used as a “plant” microphone to capture environmental or location sound. The Lectrosonics PDR is available now with an MSRP of $900 U.S.